Oh good day! 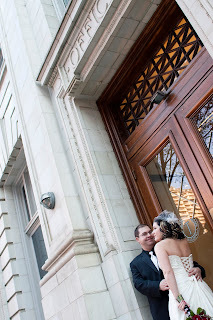 I can blog about my lovely October 31st, Saskatchewan couple today, as I received their professional pictures! This makes me so happy as I really enjoyed getting to know these two. I must say, Jaclyn and Shawn are really special people. 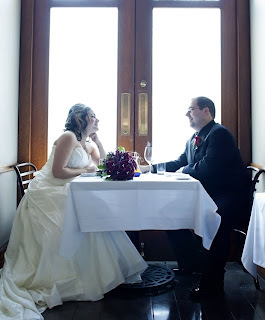 Being my first "real" couple, and by that I mean, complete strangers before they searched out my services, I was a tad bit nervous when they first came over for our initial meeting! What a pleasant surprise! They were wonderful! They are both around my age, so we chatted as though we had known each other for quite some time. They had drove in from Saskatchewan so I wanted to make sure they were happy and felt comfortable with me. 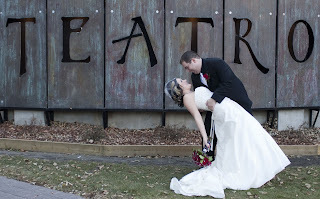 They had already worked out a lot of the details, the dress, the flowers, the venue, so my job was to tie up some loose ends, be there the day of the wedding, and also deal with the vendors. A few things that were left were photography details, the where, when and what of those, the menu and decor. For their pictures, they wanted to make sure they had somewhere nice and classy for the traditional family portraits. 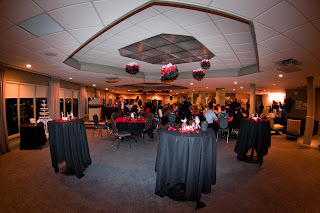 A few venue's in Calgary that offer this service are Rouge, Lougheed House and Teatro, all very beautiful places, so I knew there would be a cost involved. Teatro won that war and the place was booked for the afternoon. 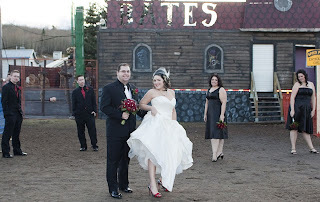 Also, they wanted some ideas for their bridal party photo's, and since they were getting married on Halloween, at Canada Olympic Park, where Screamfest is held every year, why not take advantage of all those creepy props!? One thing I really loved about Jay and Shawn is that they KNEW this was THEIR day and this made me really happy. A lot of times couples get swayed by family members, friends and members of their bridal party (which can be a bit of both), and then it turns into a big fiasco trying to make everyone happy. I loved that these two went a bit non-traditional in a few ways, and did not really care as to what others thought. A few things, well, they got married on Halloween, they met in the afternoon for pictures, as they had an evening ceremony. They knew they wanted a action station type food set up instead of a plated or buffet style dinner, and best of all, Jay's shoes, SO amazing, leopard with red patent, such a shock under that gorgeous, custom-made gown! I could really tell these two were in love, and the very best of friends, wanting only what mattered to them most. 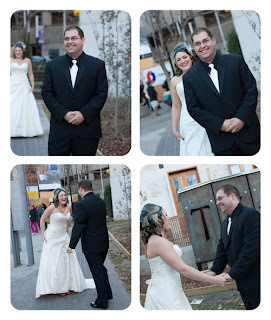 Their photographer, Lindsay Allan (http://www.lindsayallan.ca/) did an amazing job capturing the moment Shawn first saw Jay - good thing I was busy getting the reception ready or I would have burst into tears at this sight, so sweet! 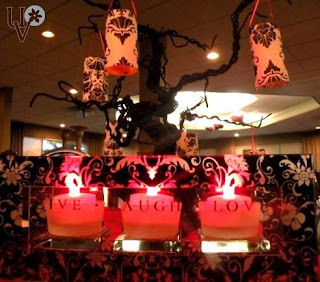 For decor, they had lots of beautiful candles, roses, really nice custom made vinyl applications for some glass posts with their names intertwined and the date, and the famous Martha Stewart tissue paper flowers in their predominant colours of black, white and red. I also crafted a spooky little tree that sat on their signing table, with handmade votive lanterns in a damask pattern hanging by red ribbon. They both had said they didn't want it Halloween themed - but to add very subtle elements of Halloween into the decor. 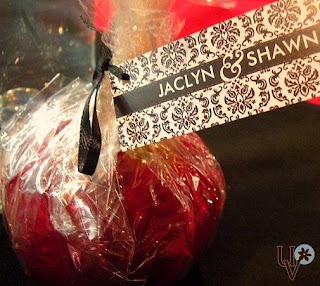 The favors were assorted candy apples with custom made damask thank you tags. The ceremony was beautiful, it was up at the Naturbahn Teahouse at the top of the hill at nighttime, so all the twinkling lights of Calgary could be seen. It was dimly lit and had a numerous clusterings of pillar candles, the ambiance was perfect. Jay and Shawn exchanged personalized vows (my favorite! ), and family members sang and played the processional song on the guitar to add a very personal touch. Jay walked herself down the aisle, being the amazing independent little lady that she is - to a beaming Shawn, it was so magical, the parts that I snuck out to see, as I also played deejay for the ceremony (a very scary moment in my life, ha ha!). Their exit song was by The Doors "Touch Me", again - so non traditional, so Jay and Shawn! Their reception was held at the bottom of the hill down a winding road and the food and wine started coming out and everyone had a great time. The families and friends all seemed really close, and there was lots of awesome dancing done by I am pretty sure everyone! I must say, I was lucky to get a Halloween wedding as they are rare, and I was so priveleged to capture some really special moments with Jay and Shawn on their big day, and even had a very ghostly experience when I went back up by myself to the Teahouse to pack up the candles, mirrors and decor. Eek! Apparently it's known to be very haunted, someone could have told me that! Yikes! 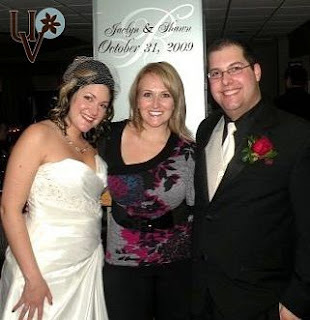 Jay and Shawn, thank you for going out on a limb and being my first ever "real" clients, you two are absolute soul mates, I have never seen anything but huge grins on your faces when you are around each other! You deserve all the best life has to offer, congratulations! It was an awesome wedding! So Happy for Jay and Shawn, and to me everything looked perfect! including them!